Naturally, this attracted a myriad of artists and impromptu performers at Burning man. Besides the expected dancing, people can be seen sporting Electroluminescent wires, LED hula hoops, and even twirling a flaming baton. The dome itself is constructed by a group called “Light at Play” with 425 struts and 126 illuminated vertices. Impressively, it needed heavy machinery to lift the dome overhead. A smaller version, the “Radiance Orb” is featured in the last video below, and might be a more attainable project for someone interested in attempting a spinoff project. The assembly is impressive, but the group is most proud of their work programming this assembly. 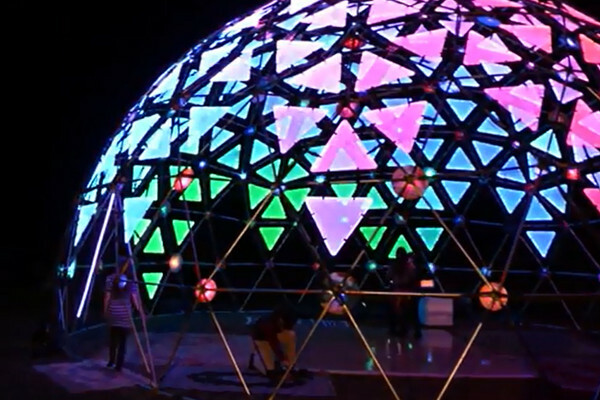 The dome can be programmed to respond to sound as an audio visualizer, controlled by an iPad, or can even be manipulated using a Leap Motion controller for wireless hand control. The large dome will be on display at the Mohawk Valley Music Festival this August in Oregon, if you’d like to see it in person.